Bushwalking is a fun, low impact way to be active. The benefits for the mind & body are obvious, and the great thing is, bush walking is accessible for most people. Learn how to safely plan bushwalk trips. Some of the best wild places are well off the beaten track, and a long way from help. So it is useful to be prepared before you go. 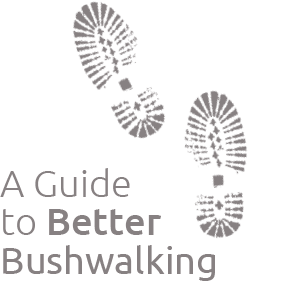 The purpose of these pages is to get some basic facts & information together so you can get outdoors and get involved in ‘better bushwalking’. These pages WILL NOT ensure your safety in the bush. As your skills and confidence grow, learn the ropes from the experts… we run courses for beginners to advanced bushwalk leaders. Get some first aid training as well. How long am I going for, who do I walk with, and who to tell?